Alphonse Mucha (1860–1939), Biscuits Lefèvre-Utile (1896), lithograph, 62 × 43.5 cm, Private collection. Wikimedia Commons. We hear little of the arts scene in Vienna around the end of the nineteenth century compared to those in Munich, Berlin, or Paris. This article looks briefly at some of the key painters there, who were part of the Vienna Secession during the height of Klimt’s career. Like Impressionism (as it was at the time, not its more recent interpretation) and the earlier secession movements in Germany, the Vienna Secession united a very broad range of artists and styles. There is no such thing as a Vienna Secession style, but the members of the movement came together to provide an alternative to the Association of Austrian Artists, in their Vereinigung Bildender Künstler Österreichs (Union of Austrian Artists). Several of its leading members were architects, and a few sculptors. Although it started in the early 1890s, the Vienna Secession was formed in 1897 and held its first exhibition the following year. In 1905, following their dissent over artistic matters, Klimt and several others left the Secession. 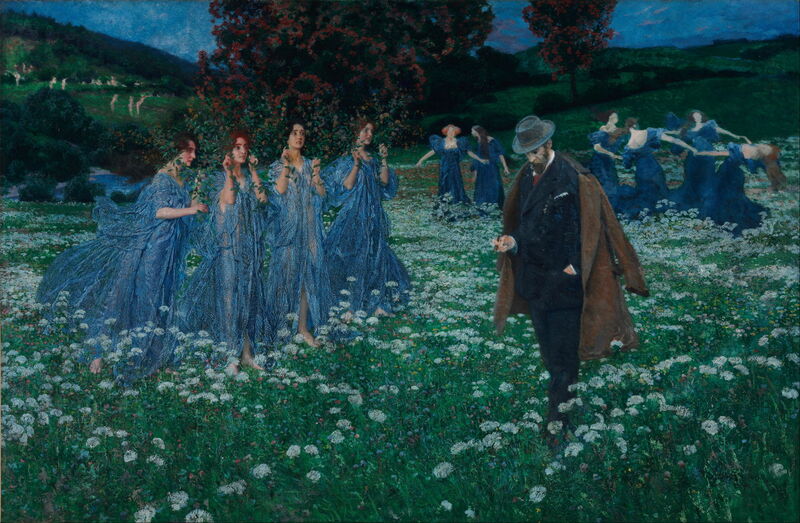 The Secession’s first president was Gustav Klimt, and its honorary president Rudolf von Alt. Rudolf von Alt (1812–1905) trained in Vienna and was the most respected Austrian landscape painter of the day. He had travelled extensively in Europe, as far as the Crimea, and painted some superb views of Italy. He was ennobled in 1889 for his artistic achievements. Rudolf von Alt (1812–1905), Altaussee Lake and Face of Mount Trissel (1859), watercolour, 26.5 x 37.1 cm, Leopold Museum (Die Sammlung Leopold), Vienna, Austria. Wikimedia Commons. 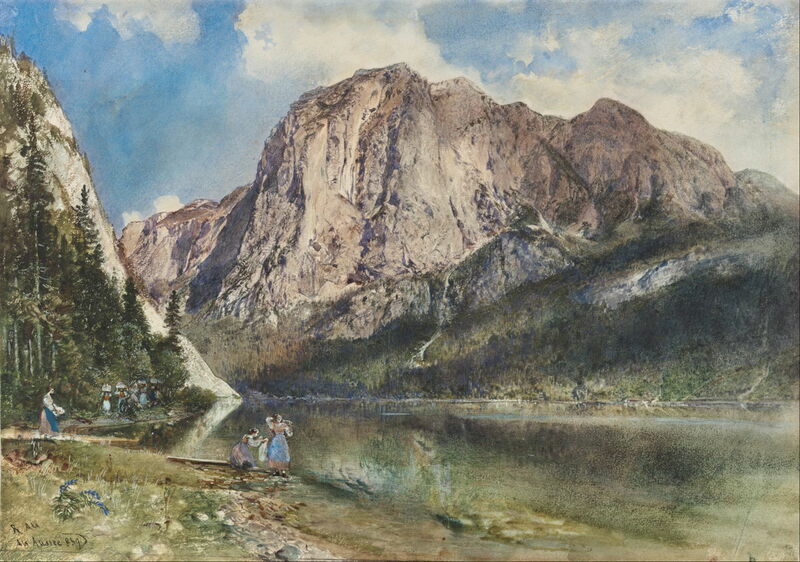 His earlier and mature watercolours are rich in detail, as in his Altaussee Lake and Face of Mount Trissel from 1859. Rudolf von Alt (1812–1905), The Old Spruce in Bad Gastein (1899), watercolour, 56.8 x 504 cm, Leopold Museum (Die Sammlung Leopold), Vienna, Austria. Wikimedia Commons. 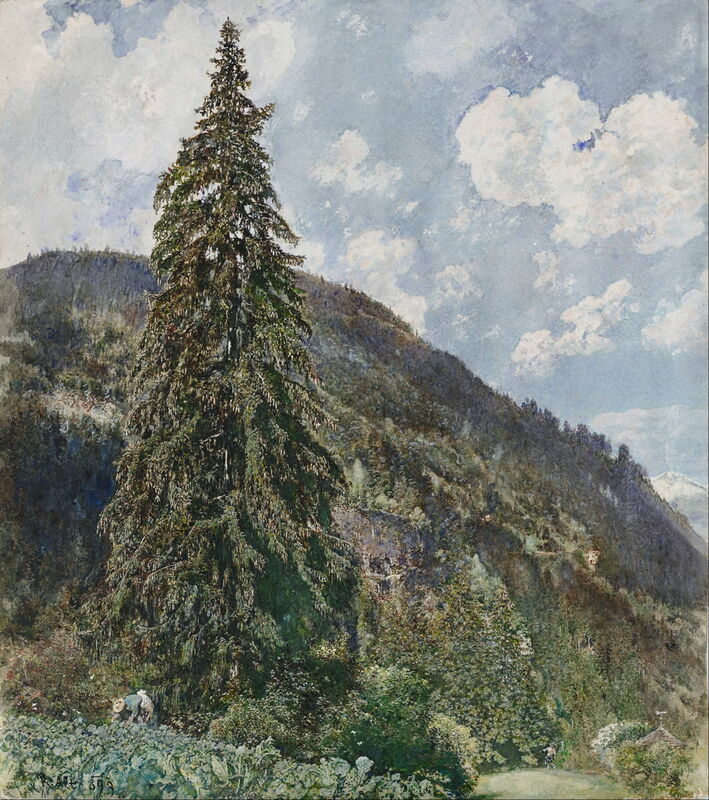 Although it is sometimes claimed that his style became looser and more ‘impressionist’ later in his career, The Old Spruce in Bad Gastein (1899) remains very detailed and precise in style. Koloman Moser (1868–1918) was another of the major painters and graphic artists in the Secession. Born and trained in Vienna, he was a co-founder of Wiener Werkstätte, a community workshop which included purpose-designed facilities for metalwork, leatherwork, woodworking, enamelling, jewellery-making, pottery, and more. At its height, it employed over a hundred craftspeople in its Vienna premises. He was responsible for the design of successful books, postage stamps, stained glass, ceramics, glassware, tableware, furniture and jewellery. Koloman Moser (1868–1918), Loïe Fuller in the Dance “The Archangel” (1902), indian ink and watercolor on squared paper, Albertina, Vienna, Austria. Wikimedia Commons. 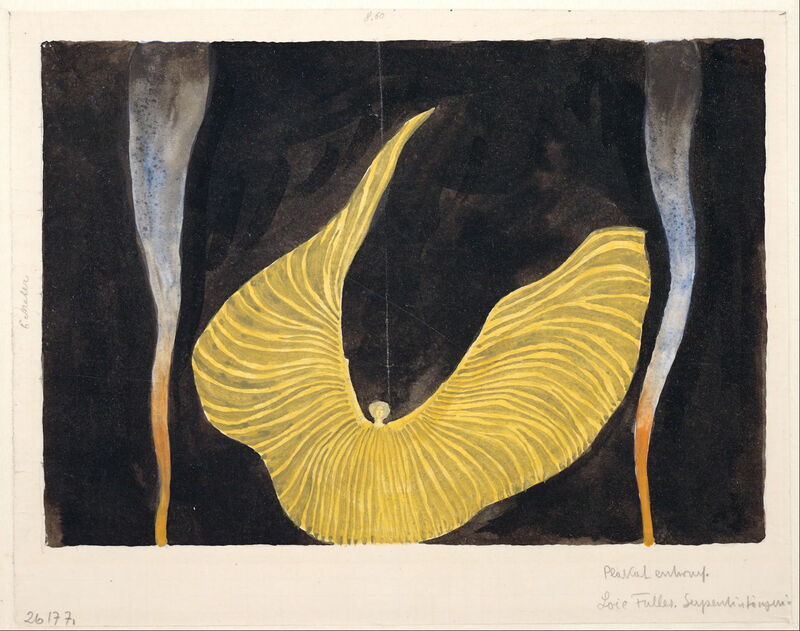 Moser’s ink and watercolour drawing of Loïe Fuller in the Dance “The Archangel” (1902) gives an indication of the style seen in his design work. 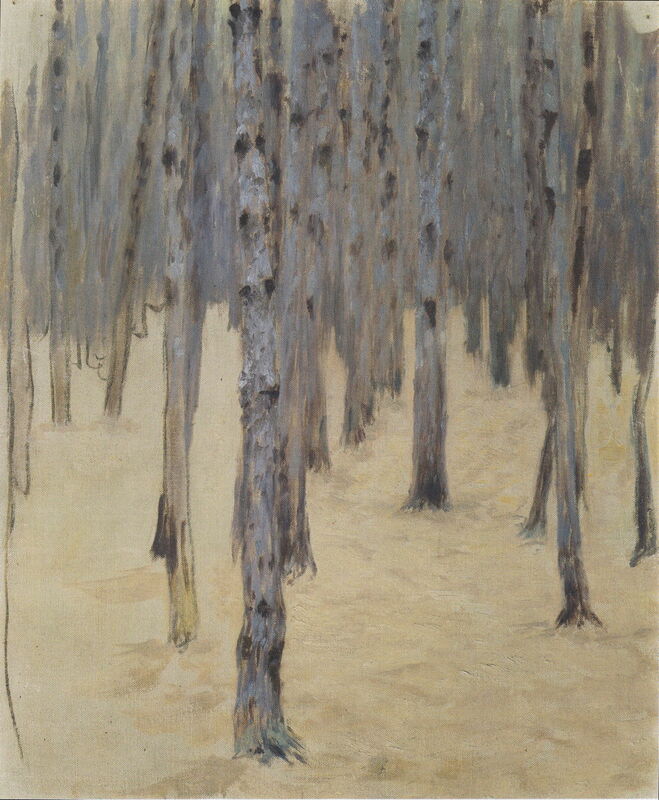 Koloman Moser (1868–1918), Pine Forest in Winter (c 1907), oil on canvas, 54.5 x 44.5 cm, Österreichische Galerie Belvedere, Vienna, Austria. Wikimedia Commons. He also painted some landscapes which appear to have been influenced by Klimt’s holiday landscapes from Attersee and elsewhere, including this Pine Forest in Winter (c 1907). Moser died in the autumn of 1918, probably another victim of the influenza pandemic which killed Klimt. I will look in more detail at Moser’s work for the centenary of his death later this year. Vojtěch Hynais (1854–1925) was Czech, from a family who moved to Vienna prior to his birth. He trained in Vienna, then with Anselm Feuerbach, and Jean-Léon Gérome in Paris. In addition to painting, he was a successful designer and graphic artist more generally, and is now best-known for his painting on the curtain of the Prague National Theatre. 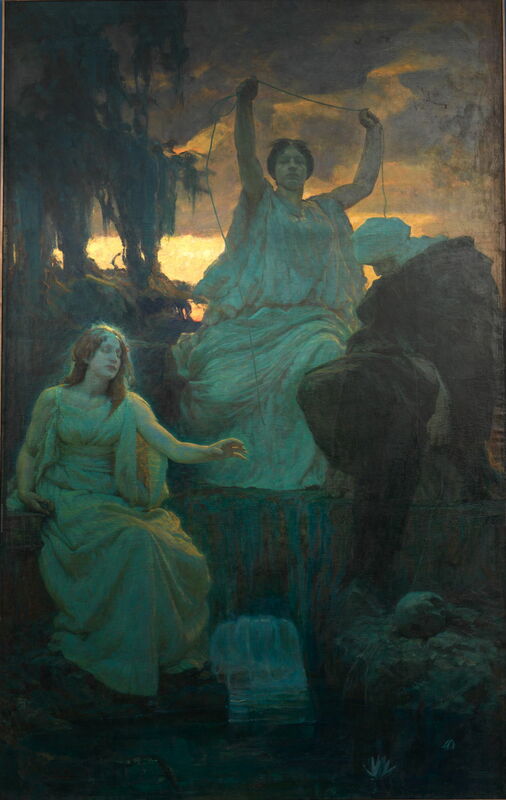 Vojtěch Hynais (1854–1925), The Judgment of Paris (1892), oil on canvas, 58 × 100 cm, Národní galerie v Praze, Prague, Czech Republic. Wikimedia Commons. 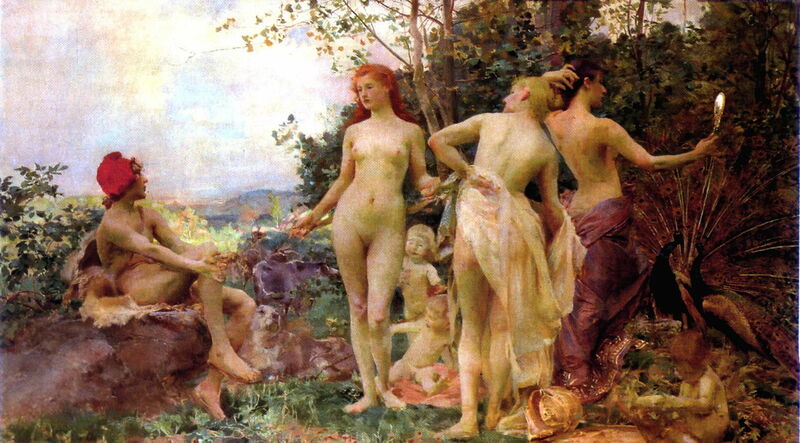 His paintings, though, retain quite an academic style, as shown in The Judgment of Paris (1892). Maximilian Lenz (1860-1948) was another native of Vienna who trained in the city. He painted, was active in several fields of the graphic arts, and sculpted. In the early 1890s he designed bank notes in Buenos Aires, but returned to Vienna just before the Secession. His painting style ranged from Symbolism to ‘naturalism’. Maximilian Lenz (1860-1948), A World (1899), oil on canvas, 121.5 x 186 cm, Museum of Fine Arts, Budapest, Hungary. Wikimedia Commons. As with several of his oil paintings, A World (1899) evokes a dream world, expressed using some quite intense colours. It was exhibited at the fourth Secession exhibition, where it was praised, and was also shown at the Munich Secession exhibition in 1901. Lenz accompanied Klimt in his visit to Ravenna, Italy, during the winter of 1903-04. Alois Delug (1859-1930) was an Austrian from Bozen who trained in Vienna. He was out of the city between 1885 and 1896, first travelling in Europe, then painting historical and religious works in Munich. Although a founder member of the Vienna Secession, the following year he resigned from it, and was appointed a professor in the Academy, eventually becoming the director of its school of painting. Alois Delug (1859-1930), The Norns (1895), oil on canvas, 223 x 354 cm, Museum of Modern and Contemporary Art of Trento and Rovereto (Mart), Italy. Wikimedia Commons. Delug’s The Norns (1895) is an unusual work showing the three Norse mythical equivalents of the Fates. After Klimt, by far the best-known artist associated with the Vienna Secession was Alphonse Mucha (1860–1939). Born in Moravia (now in the Czech Republic), he worked in Brno and specialised as a scenery painter there. From 1879, he worked in Vienna as a decorative and portrait painter, before returning to Brno. He then trained in Munich and Paris, where he was contracted to Sarah Bernhardt to produce posters advertising her stage productions. 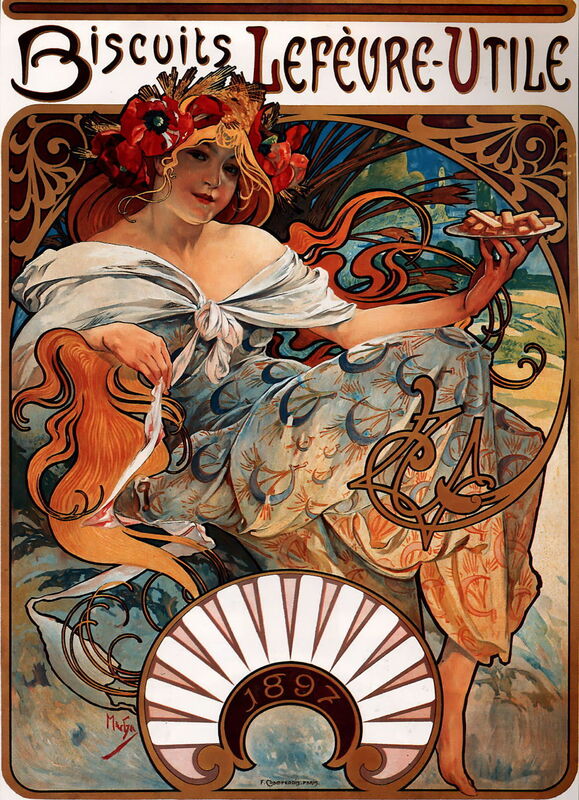 Mucha’s indiosyncratic style, shown well in this lithograph promoting Biscuits Lefèvre-Utile (1896), rapidly became the lead for Art Nouveau, which became very popular. 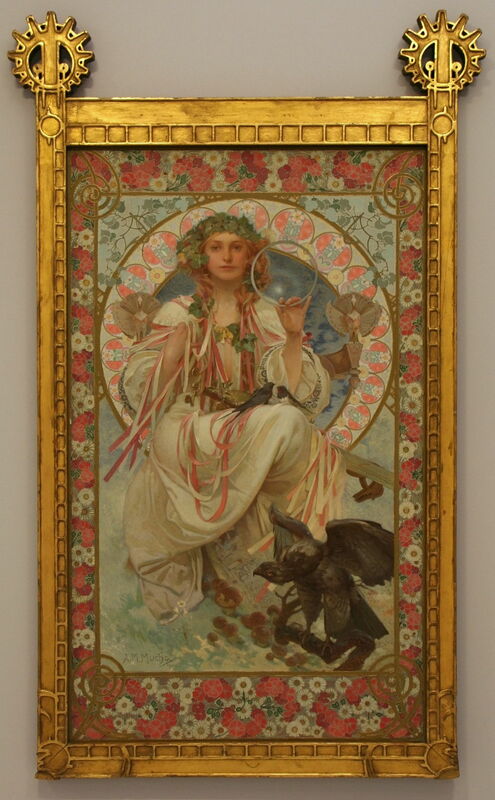 Alphonse Mucha (1860–1939), Portrait of Josephine Crane Bradley as Slavia (1908), oil and tempera on canvas, 154 × 92.5 cm, Národní galerie v Praze, Prague, Czech Republic. Image by Ophelia2, via Wikimedia Commons. Like Klimt, Mucha used metals for lavish and stylish frames, as shown in this Portrait of Josephine Crane Bradley as Slavia (1908), painted using the Renaissance combination of tempera and oils. 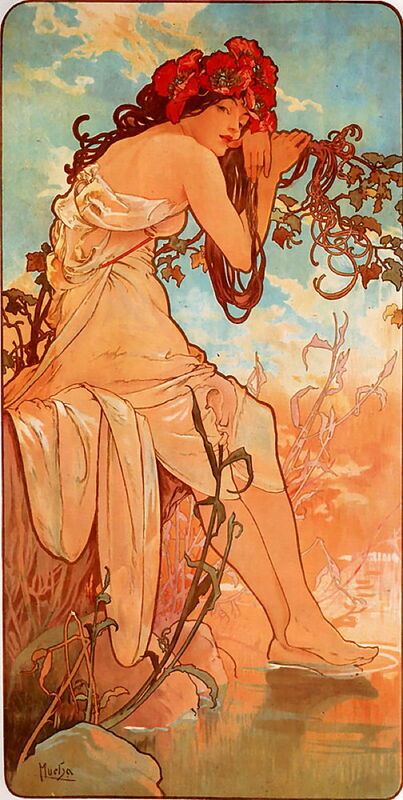 Alphonse Mucha (1860–1939), Summer (1896), oil on panel, dimensions not known, Private collection. Wikimedia Commons. Although many of his paintings, like Summer (1896), used Art Nouveau style, he also painted much more traditional narrative works, which are now less widely-known. This is one of the vast canvases in his epic work showing key events in the history of the Czech people. 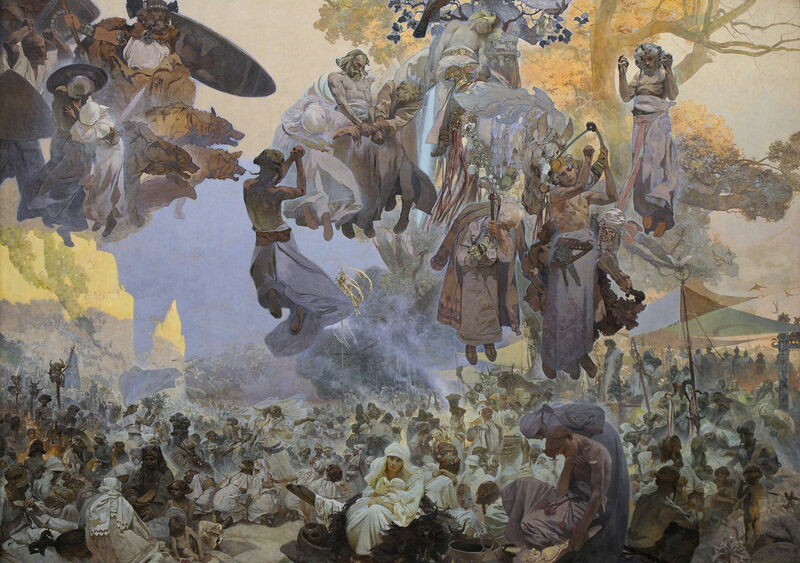 The Celebration of Svantovit in Rujana: When Gods Are at War, Salvation is in the Art was completed in 1912. Mucha was also a gifted singer, and lifelong friend of the composer Leoš Janáček. Finally, Hugo Baar (1873–1912) was a Moravian landscape painter from the next generation of artists, who came to Vienna as a student. He was influenced by members of the Vienna Secession, particularly Klimt, which shows in several of his works. 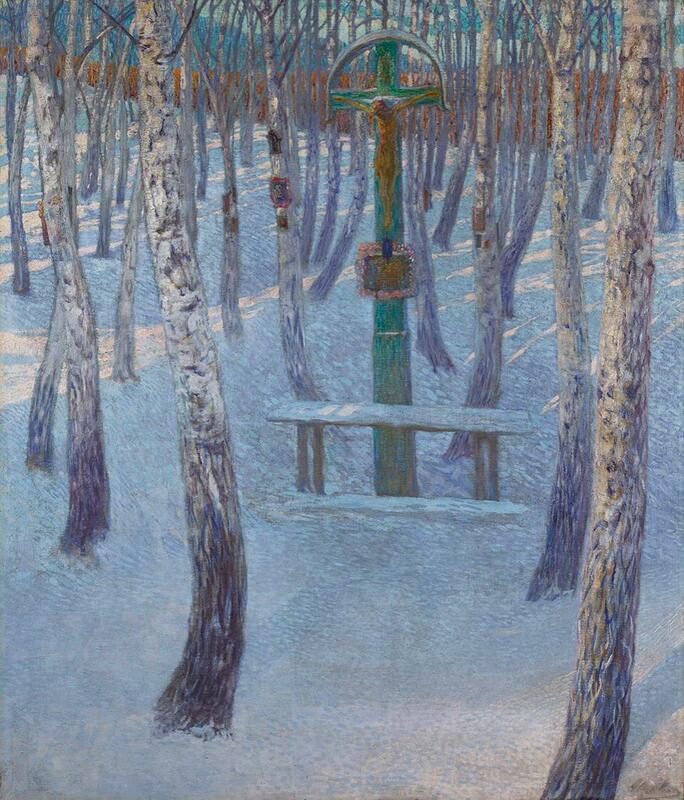 Hugo Baar (1873–1912), Waldandacht (Forest Shrine) (c 1900), oil on canvas, 139 × 119 cm, Österreichische Galerie Belvedere, Vienna, Austria. Wikimedia Commons. Baar’s Waldandacht (Forest Shrine) from about 1900 is strongly reminiscent of the birch woods in Klimt’s holiday landscapes. Hugo Baar (1873–1912), A Meadow Landscape with a Farm (c 1905), oil on canvas, 99 × 98 cm, location not known. Wikimedia Commons. 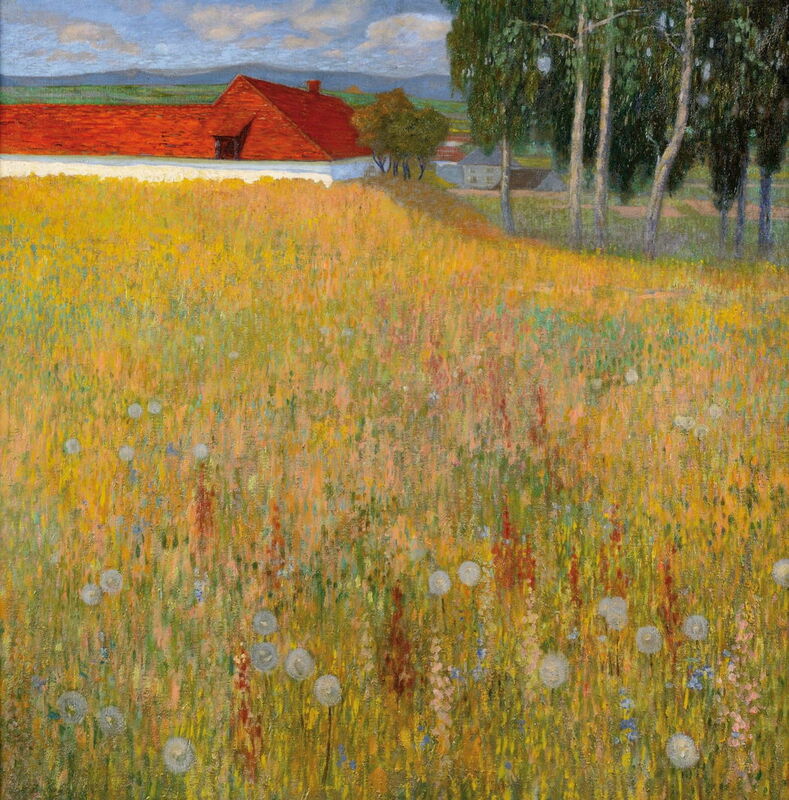 Other paintings of his, such as A Meadow Landscape with a Farm (c 1905), show greater independence. Tragically, Baar died suddenly in Munich, in 1912, when he was only 39. There were, of course, many other painters and artists of significance at the time. I have not mentioned the young Oskar Kokoschka, who came to Vienna to study at the School of Arts and Crafts from 1904; his work is still in copyright. Egon Schiele trained in Vienna from 1906, and became a protégé of Gustav Klimt the following year. As he also died in 1918, I will be looking in detail at his career and work later this year. Hopefully the small sample above gives you a better idea of the artistic milieu within which Gustav Klimt worked and exhibited. Posted in General, Life, Painting and tagged art nouveau, Baar, Delug, Hynais, Klimt, Kokoschka, Lenz, Moser, Mucha, painting, Schiele, Secession, von Alt. Bookmark the permalink. There is a very good secessionist show in Rovigo Italy right now. It includes furniture and graphics (quite strong), as well as many of the artists you mention. I only wish I were able to go and see it! Just what do XProtect and MRT protect your Mac from?